We have tiny dogs. When the children’s clamor for a dog became too loud to ignore and the guinea pigs as cuddly mammals no longer cut it, I had one criteria – the dog had to have miniscule poop. I was not willing to pick up big poop with my hands in public on the streets of New York City. In came the Toy Fox Terriers. They are small and they are smart, but they are shivery. They are cold even in the apartment. My daughter had the idea to knit cowls for them and came up with the easy pattern below. 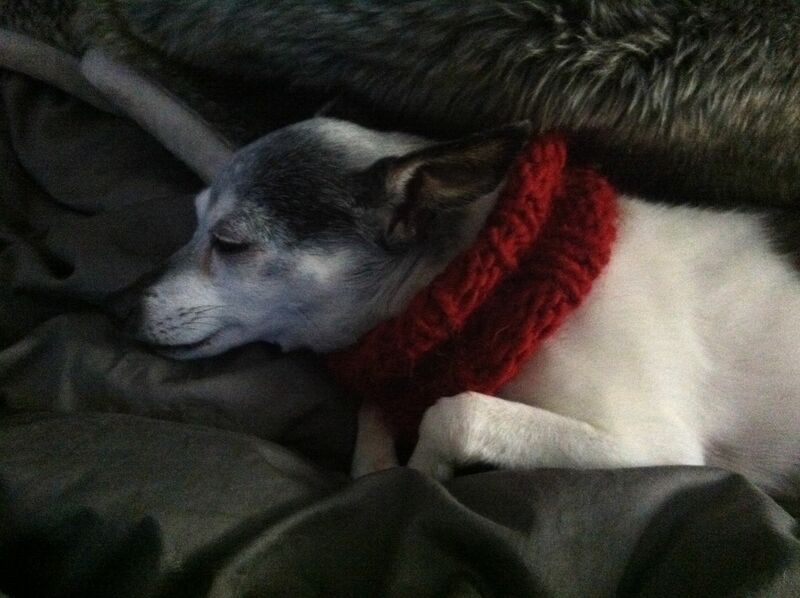 The dogs wear their cowls all winter in the apartment, they lounge and they sleep in them on bitter nights. They wear them instead of coats on balmy days in autumn and early spring. We use Brown Sheep Lambs Pride Worsted yarn. It is 85% wool and 15% mohair – very good quality. It comes in tons of colors and is very inexpensive for natural fiber. This pattern is sized for very small dogs (ours are 6 and 7 pounds), so you should adjust the number of cast on stitches as needed. The fit is snug enough so that it doesn’t come off easily but loose enough that they are comfortable hanging out with their cowls on. Cast on 26 st. on number 9 needles. cast off and stich together into a round cowl, sew in all loose ends. 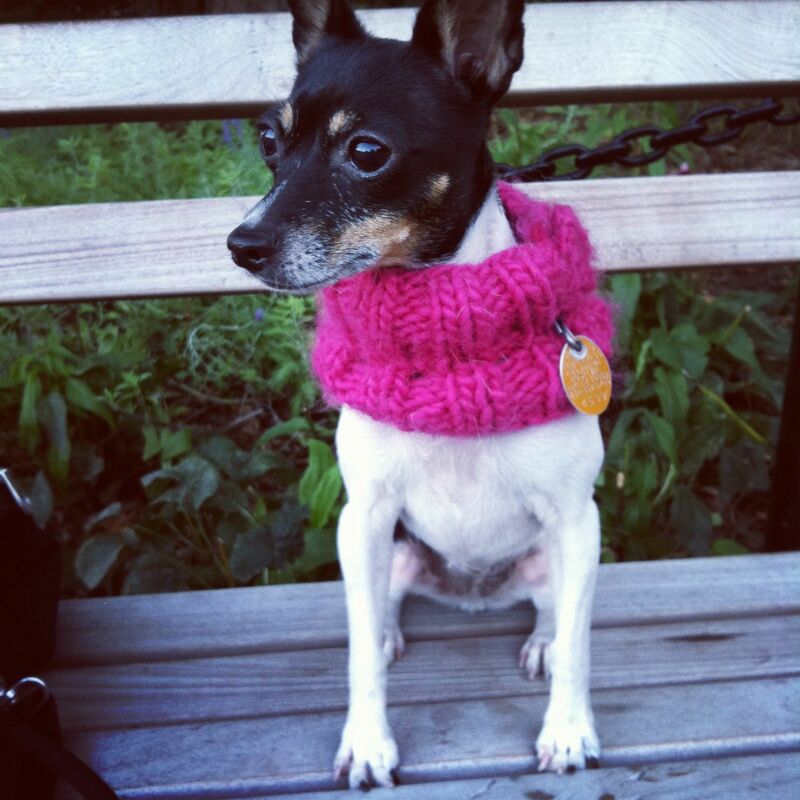 This entry was posted in knitting and wool projects and tagged dog cowl, dog knitwear, knitting, knitting pattern for dogs, small dog knitwear, small dog sweater, toy fox terrier by ileana. Bookmark the permalink. Unbearably cute! And about the poop size? That wasn’t a consideration when I got my dogs (basenji) but now I don’t think I could deal with a larger size poop. One more thing, I believe Lamb’s Pride has some mohair in it, which makes it even yummier in my opinion. thank you Peggy! I didn’t know about the mohair, yes, that would be what makes it so nice. I hope you make the cowl for your Basenjis! Very, very sweet. 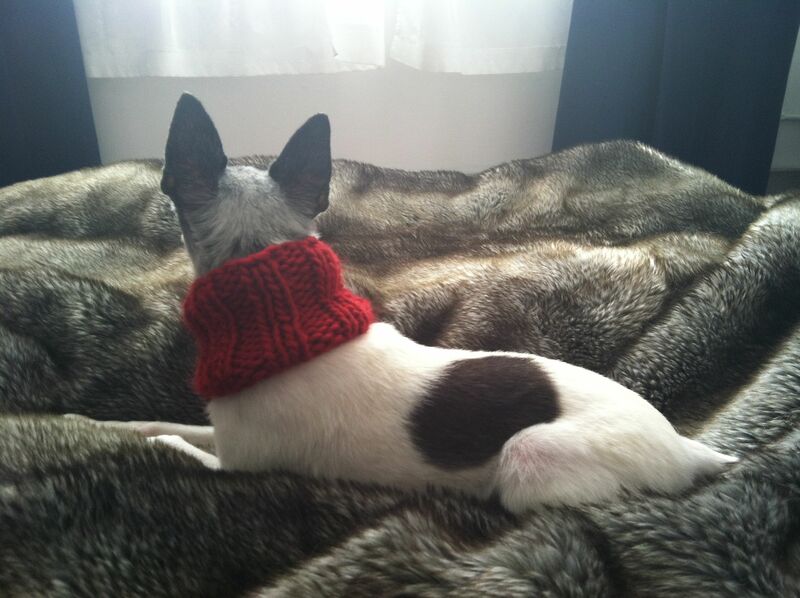 For a keen knitter, I chose completely the wrong dog – a cairn terrier. She has a double coat so no need to wear anything ever, and needs it hand stripped from time-to-time especially in summer as she doesn’t shed. All the fun I might have had if we’d gone for something shorthaired and streamlined! I love your pattern! We are in the process of adopting a newborn Chi. (her eyes arent even open yet), so Ihave Mid-March before I get to have her. I immediately went lookin for things to knit for her. I ADORE your cowl! I am off to knit one! Thank you so much for your kind words. Good luck with the puppy. Lolo (our old guy) wears his cowl 24/7. He loves the warmth of it. If you are so inclined, I’d love to see a photo of the puppy with the cowl once you have her. OMG I am dying of cuteness! These are so sweet and practical! Love the idea and thanks for sharing the pattern. Thanks Anna, I’m glad you liked them. How do like espresso with clementine ? Hi Ileana! I finally checked out the cowls. They are lovely. I wish I knew how to knit!! Thanks for sharing and God bless those adorable TFTs…… No bias at all here!! Thanks Margi, I’m so glad you like the cowls. The gorgeous canine models are from Margi’s Fox Hill Toy Fox Terriers. Hi im after a beanie pattern for my pug. Would have any at all? Hi Gale, Thanks for reading. This is my only dog apparel pattern. I do suggest that you head over to ravelry.com. It is a knitting community site with a database of searchable patterns, groups (they have small dog knitting groups), and many other tools. It is an amazing resource for knitters and crocheters. Good luck! So very stylish and delicious! I recently knitted a cowl for a shivery human born in the year of the dog. Also used Lamb’s Pride, I believe, a natural dark chocolaty taupe. Wow! Your comment is poetry, Elizabeth. Hi Ashley, the circumference around the tightest part which is the middle where the decrease happens (row 8) is 12 inches. The pattern is so simple, adjustments for different sized dogs will be easy. Good luck and thanks for reading. Thank you for the pattern – I made 2 for my daughter for christmas in pink – I had to change the pattern just a little for a small dog with long hair. she oves them. (My daughter picked out your pattern). Never would have thought of doing this. Thank you so much. We enjoy her dogs so much. Hi, thank you so much for writing. I’m so glad you liked the pattern. I’d love to see a photo of the puppy in pink. If you feel like sending one, I can put it on the loisaida nest facebook page. I think it would be so cute. this is my email: loisaidanest@gmail.com. Happy Holidays!